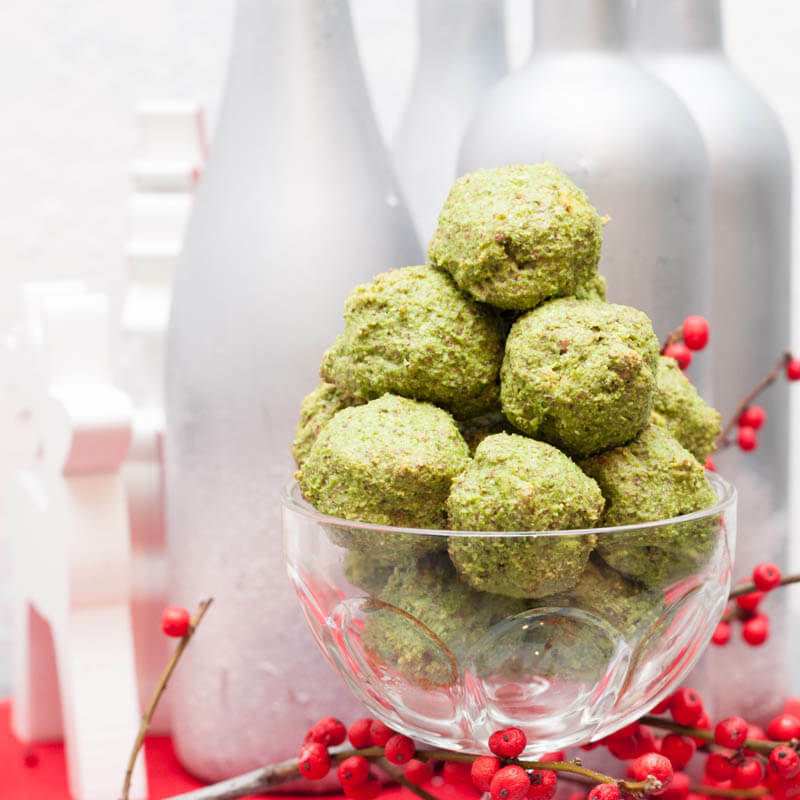 These healthy Vegan Spinach Balls are the perfect appetizer for your next party and even make for a kid-friendly snack! It’s been quite a while since my last recipe post. I’ve got to thank colds, flus, family visits, and vacations for that :) Before all this happened I had cravings for spinach balls. My grandma makes some delicious spinach balls but sadly they aren’t vegan. I tried googling “vegan spinach balls” but came up empty. 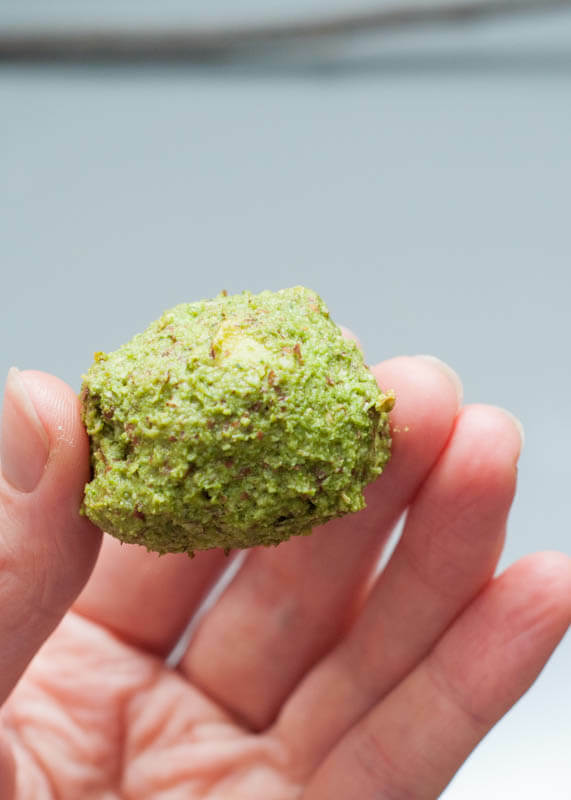 Most spinach balls have egg, bread crumbs, and frozen spinach. 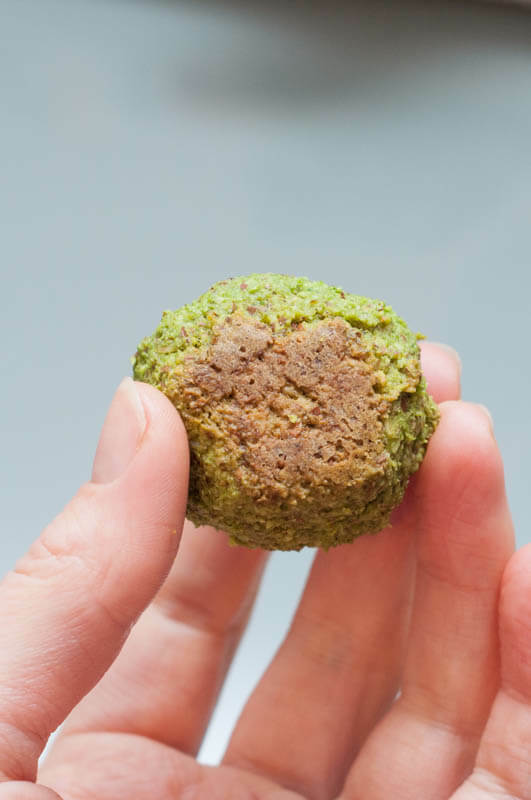 I wanted to make a vegan spinach ball that used fresh ingredients and also happened to be gluten-free. 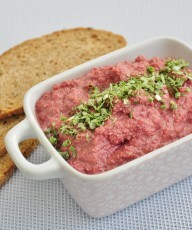 I came up with this simple recipe that is a delicious appetizer or snack. My Grandma usually makes these for Thanksgiving and Christmas but I think they are a great appetizer all year around. Spinach is in season in the winter and spring months making it especially great when you can buy fresh spinach locally. That being said, you can also makes these using frozen spinach (check notes on the recipe below for how to). However, I find that the spinach ball burst with more color and flavor when using fresh spinach as opposed to frozen. Once the mixture is nice and thick, scoop out tablespoon sized balls and bake in the oven until they are nice and brown on the bottom. Delicious! Both boys were popping these in their mouths non-stop. I didn’t mind. 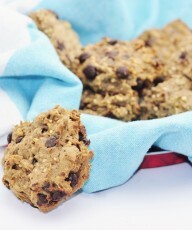 These are filled only with healthy clean ingredients and even Flax seeds (or Chia seeds). We ate them as snack but are actually meant to be served as an appetizer. 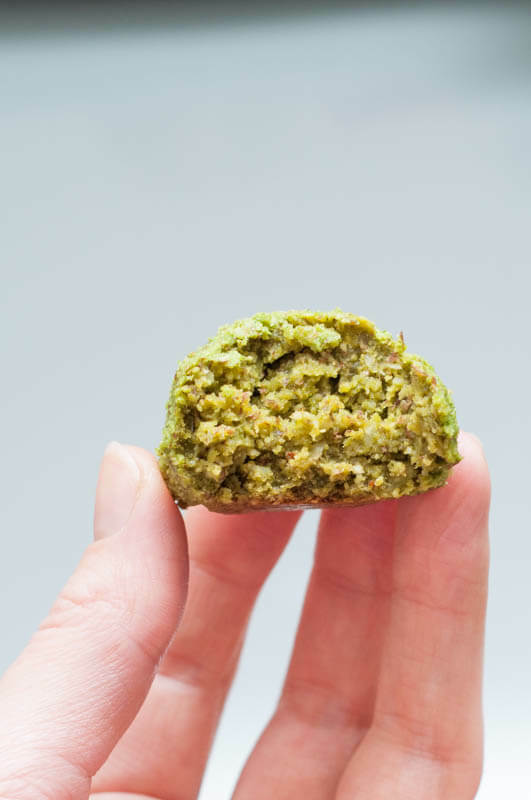 Delicious and easy to make Vegan Spinach Balls! They're the perfect healthy appetizer for any party or even great as a snack! 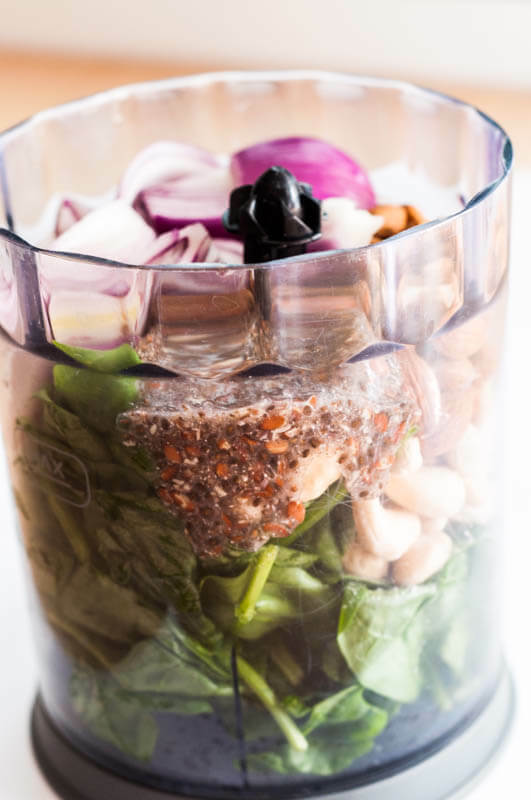 Place all ingredients in a food processor and pulse until nuts are slightly ground. If too much for food processor, process ingredients in batches. and mix together in a bowl. 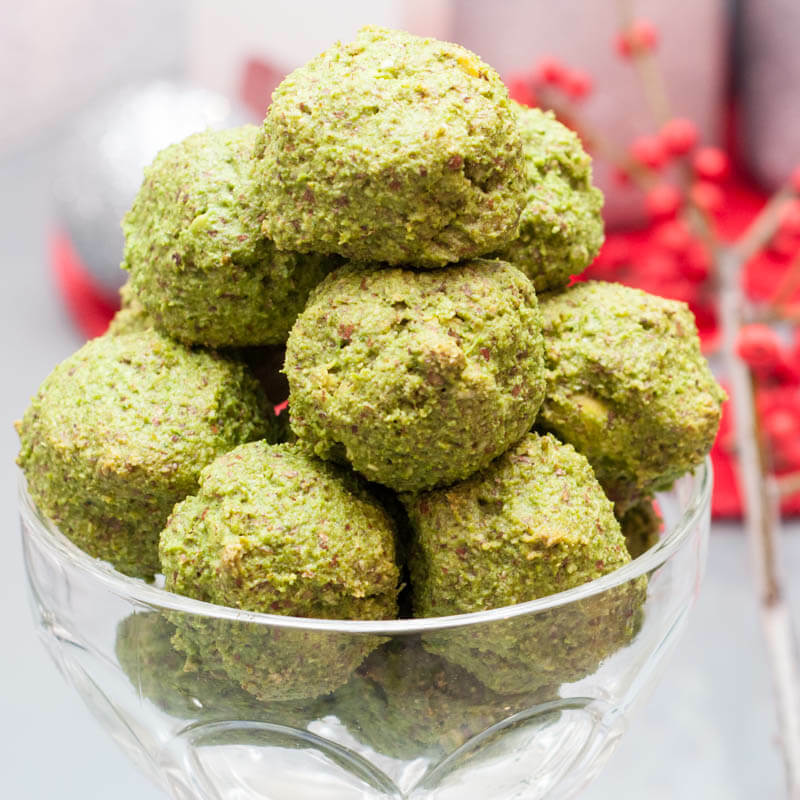 Scoop tablespoon sized balls of the spinach mixture out of the food processor or bowl and place on cookie sheet. Bake in oven for 15-20 minutes until bottoms of the spinach balls have browned. Remove from oven and allow to cool for a minute on a cookie rack. Serve warm. 1) Prepare Flax or Chia eggs by mixing 1 tablespoon ground Chia or Flax Seeds with 3 tablespoons of water. Allow to sit for 15 minutes until a thick gel forms. This is your egg replacement!2) Spinach balls can be eaten cold as well but taste best when warm and fresh out of the oven. If this is not an option pop them in the microwave for a few seconds to warm up before serving.3) You may use frozen spinach if needed. Allow the spinach to thaw completely and drain it of any excess water before using.4.) If your mixture is too wet to form balls, add more oats or almonds. If your mixture is too dry, add a bit more olive oil or a bit of water. 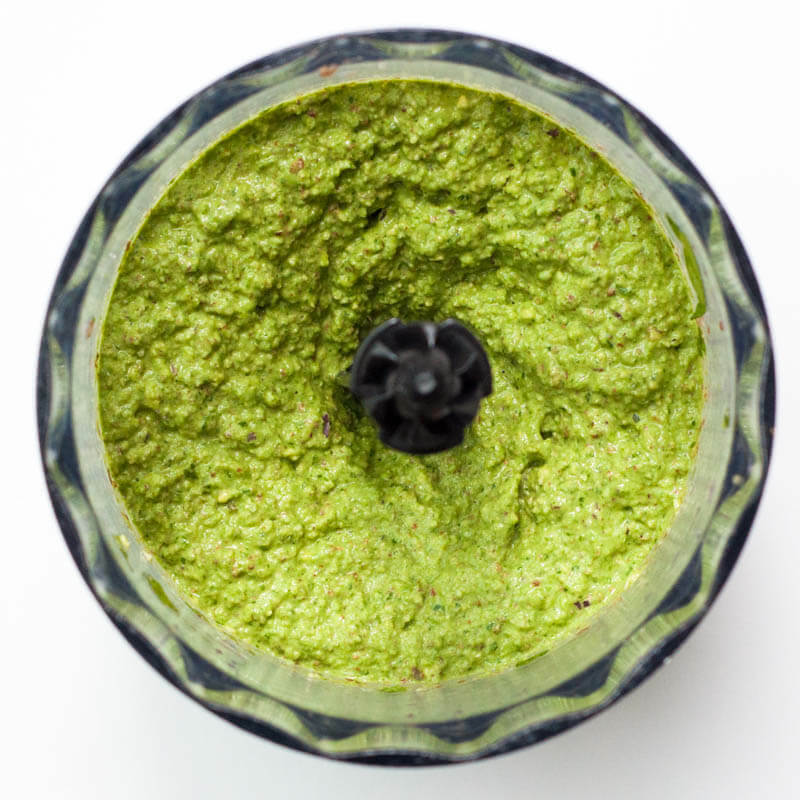 Looking for another great vegan recipe that uses lots of spinach? 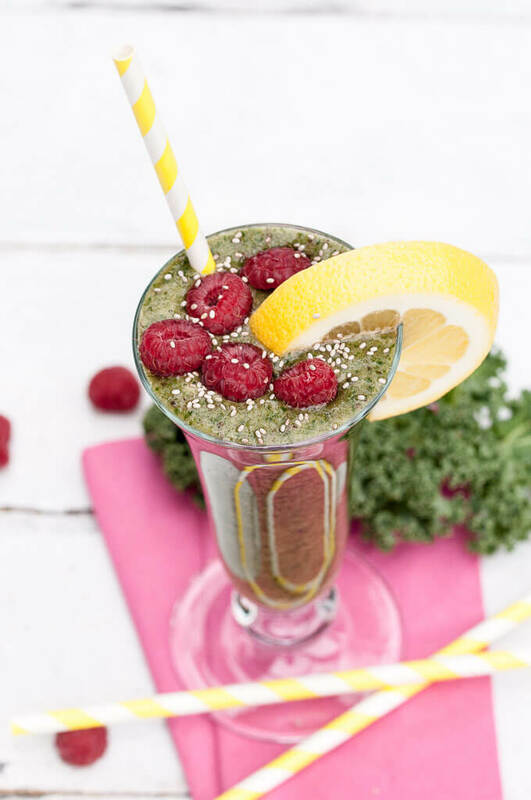 Make this yummy Kale Spinach Smoothie! yum! My mother used to make spinach balls. Can’t wait to try! Thanks Jess, Your mother was a smart lady. Spinach balls are the best! Hope you like them! Can I make this recipe without oats? 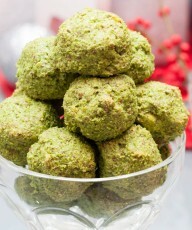 You can omit the oats by adding more almonds to dry up the spinach ball mass. I won’t be able to tell you the exact amount though. Slowly add more almonds until it begins to thicken. Enjoy! 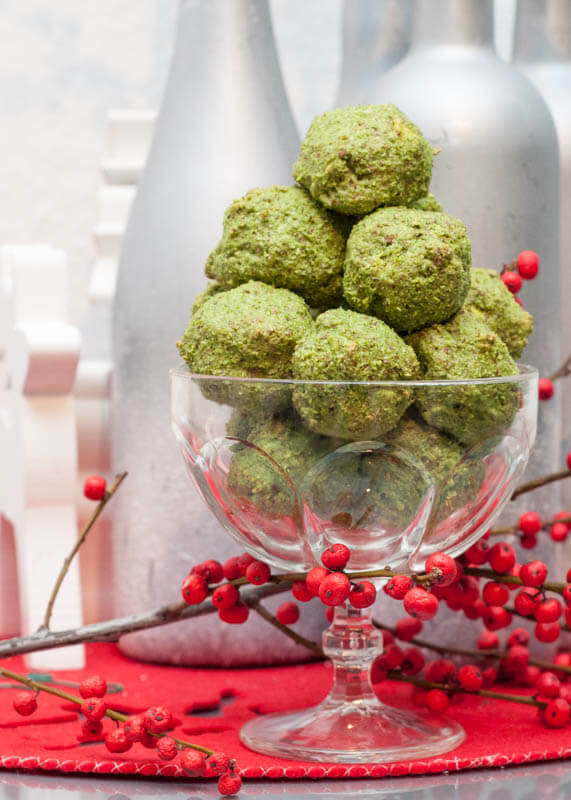 These actually look delicious, even though I have never had spinach balls. Are they kind of like falafels with spinach flavor? Yes, my bad! Thanks for letting me know. Just fixed it. There a little bit like falafel but the flavor is a bit milder. The cashews give it a bit of a cheesy flavor too. I’ve even used these spinach balls as vegan “meatballs” on pasta. What a fantastic idea! These sound really awesome. Thanks Trinity :) They are so good. The pictures don’t do them justice! I can tell by the ingredients that they are brill! Does the nuts need to be soaked first? Do you know if these can be frozen, either before or after being baked? I would love to make a huge batch and save some for later. Thanks! That is awesome news! Going to make a huge batch today – I have so much spinach in the garden! I’m going to try these – but I’ll use home made toasted curried nuts – since they are baked there is really no difference in using raw . Hello, This recipe looks great – I was going to use them in a curry, like spinach koftas, have you tried this or do you think from the consistency it would work? Just made these as a quick way to use some of the boatload of spinach I didn’t want to go to waste this week and WOW! These are soooo good (my only adjustment was adding a bit of nutritional yeast into the mix). They look and taste so fresh, and they’re really getting me through studying for finals right now…might have to eat the whole batch myself. Thanks for the recipe! Hi Kierstin, Adding nutritional yeast to these sounds delicious! These spinach balls are definitely addicting. Last time I made them, I tried hogging them but failed miserably. 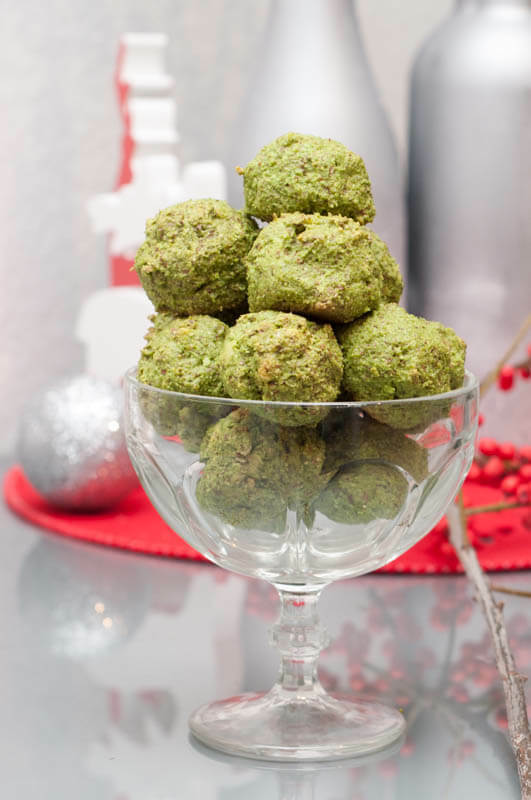 As soon as my boys know we have spinach balls in the house…they are gone. Good luck on your finals! Just wanted to let you know these are amazing I make them all the time and even my husband loves them and asks me to make them! So I have made these twice now, first time I used breadcrumbs and blah did not work for my taste over seasoned. I am not very good at throughly following a recipe,all about experimenting. Followed this but with just almonds, all we had on hand. But after baked was told needed more. Was bland, edible but bland. So to eat them we mixed sour cream and sambal, not vegan but neither were the family that were eating them. What could I add? 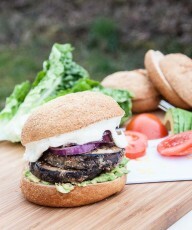 because these can be a hit for everyone’s lunch box for work here. I like experimenting with recipes as well. It’s all about the trial, error, and the occasional “OMG that tastes amazing” moments. I would definitely give a try with the cashews. They definitely gives these spinach balls more of cheesy and creamy taste. You could also add one or two garlic cloves to the mix and experiment with different seasonings (paprika, cumin, pepper, cayenne pepper, turmeric, etc.). I’ve finished making some Grinch Balls (hee hee!) Half of them are in the oven right now; the other half are headed for the freezer. I’ve added garlic, dill and thyme to mine … oh, and black pepper. I would’ve added nutritional yeast too, but I’ve already added it to a herby cauliflower and broccoli bake that I’ve just frozen, and I’ll be serving it all for a meal for my mum at the weekend, with some butter beans in tomato sauce. I made these yesterday to bring to a friend’s family for a Shiva call and all I can say is that they were the talk of the Shiva! Everyone loved them! Will be making these again! 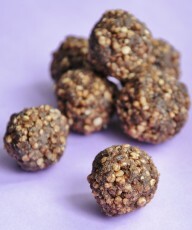 I made a double-batch and used chia “eggs” and left the nuts a little chunky for some crunch. Yum!!! These look delicious! 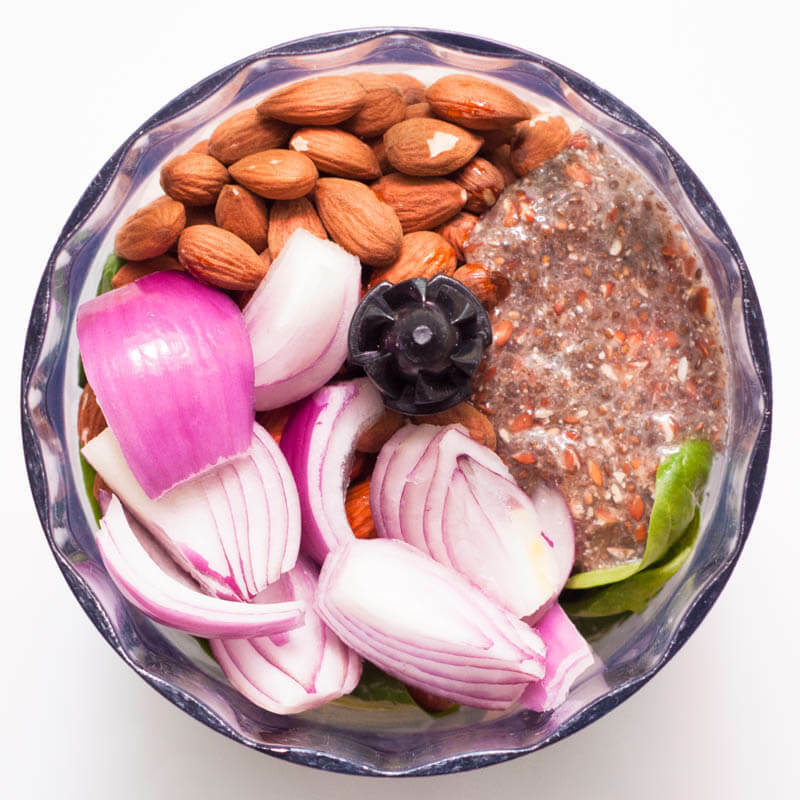 What can I substitute the cashews and almonds with? I want to make this a school friendly snack. I am in the process of making these and made the assumption that oats means oatmeal, but I wonder if it is supposed to be instant oatmeal, steel cut oats, or whole oats What did you use? 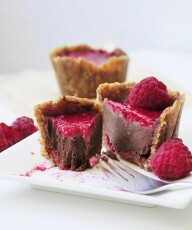 I love this recipe although I haven’t eaten them yet. Easy peasy and with great ingredients. Thank you. I try to go easy on the nuts and never use oil since I tend to put on the pounds, so I used besan (chickpea flour) to replace most of the nuts and it still came out great, thanks! 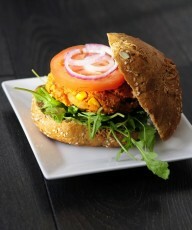 That’s great to know that chickpea flour works as a substitute. I’ll try that out next time. Thanks so much!